Feb. 8, 2019 10:40 p.m.
Tyler Nypower had every reason to believe he was about to score. The Nelson Leafs forward was trailing behind his teammate Mitchell Lavoie, who used a strong solo effort to break through the Creston Valley Thunder Cats’ blueline. Lavoie found Nypower alone for a one-timer that should have gone in had opposing goaltender Sam Burford not made a mid-air diving save across the crease to stun Nypower. The Leafs didn’t need Nypower’s goal anyway. Jack Karran and Emery Neilson each scored twice as Nelson won its fourth straight game, 5-1 over the Thunder Cats on Friday. Shawn Grobowsky added a single for the Leafs (31-10-2) and goaltender Hunter Young made 17 saves. Trail Thompson had the lone goal for the Thunder Cats (10-31-3), with Burford stopping 31 shots. The Leafs didn’t waste time getting on the scoreboard. They fought to keep possession along the boards and were rewarded when a shot off Burford found an off-balance Neilson for the rebound goal just two and a half minutes into the game. Nelson added another just over a minute later. Reid Wilson caught the Thunder Cats sleeping when he passed the puck to an open Karran in the slot. The Leafs captain’s shot elicited a half-hearted save attempt from Burford and it was 2-0 for Nelson. The early lead suggested a blowout in the works but Creston Valley didn’t break. After Burford turned heads with his save on Nypower, Thompson cut the Leafs’ lead to one with a power-play goal in the dying minutes of the first period. With Leafs defenceman Tulsen Fawcett in the box serving a tripping penalty, Thompson wired a shot that beat Young glove side. That goal rubbed Leafs head coach Mario DiBella the wrong way. 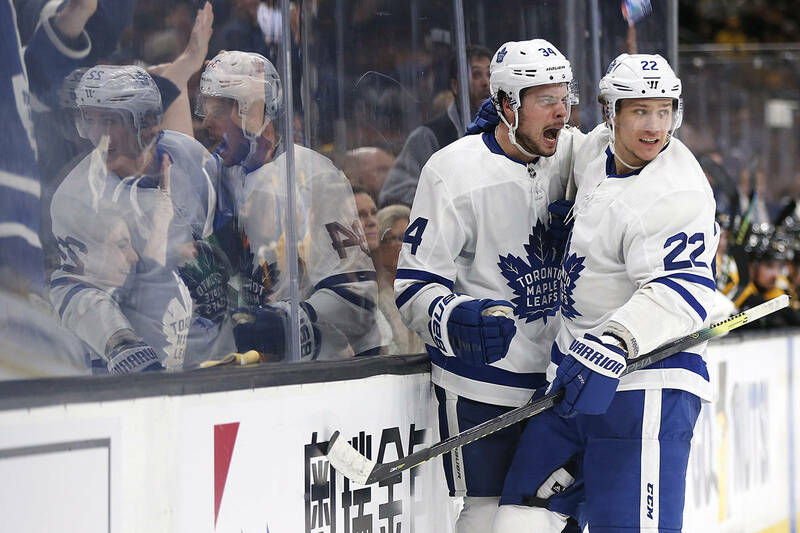 Nelson’s final stretch to the playoffs is heavy on teams the Leafs should cruise past, but DiBella warned his players against complacency in a pre-game talk. Neilson also acknowledged the light schedule — three of Nelson’s upcoming final five regular season games are against teams with losing records — but said that should be considered a red flag. Grobowsky restored the Leafs’ two-goal advantage on yet another poor save attempt by Burford. The Leafs forward slid a slow shot past Burford’s pad that the goalie was too slow to react to, giving Nelson a 3-1 lead about eight minutes into the second. Grobowsky and Lavoie were joined on a line with defenceman Andrew Gates. The peculiar roster move paid off for the Leafs coaching staff. Play paused with five minutes left after Nelson defenceman Michael LeNoury laid a massive hit on Creston Valley’s Logan Berggren that sent a buzz through the crowd. Berggren was examined on the ice by a trainer and returned to play while LeNoury was not penalized for the hit. Nelson extended its lead to three on the power play halfway through the third period. Kaleb Comishin fired a slapshot that Burford stopped, but Karran was on the doorstep for the rebound goal. The Leafs added one more with 4:45 left in the game. Cole Wyatt took the puck behind Burford, turned and found Neilson ready for the shot and his second goal of the game. Leaflets: The game was the first time this season the Leafs wore their third jerseys marking autism awareness. Nelson will wear the jerseys at all home games through February. … Nelson next visits the Beaver Valley Nitehawks on Saturday.